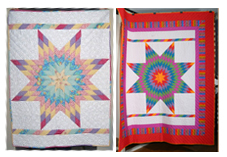 The following Cabin Creek Quilts creations--uniquely designed using vivid designer fabrics--will be featured in special events and promotions. Order or inquire about styles in stock by contacting Rebecca@cabincreekquilts.com. Ask us about our CCQ Signature Design Services. 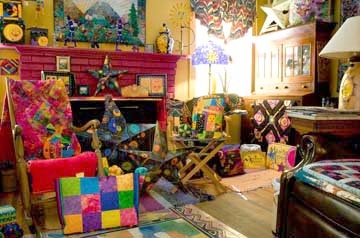 We can create customized environments with Cabin Creek Quilts art quilts for your board room, offices, and residential spaces. 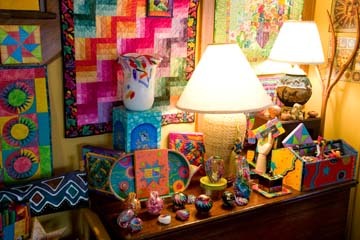 Every quilt is a one-of-a-kind creation, so the best way to order is to call us at (304) 346-2160 and we can discuss your unique design needs. You may also reach us by email. For the seventh year, fifty handmade ornaments designed and embellished by Charleston artist Rebecca Stelling adorn the West Virginia tree in the President's Park at the White House in Washington, DC. 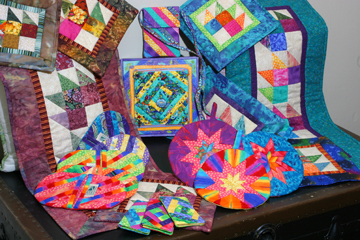 Serena Toppins, a Lincoln County quiltmaker with Cabin Creek Quilts, crafted the fabric stars. One additional ornament is featured on a tree in the White House Visitors Center, along with one from every state. Mountain Artisans and Cabin Creek Quilts sponsor the ornaments on the West Virginia tree. Each individually crafted limited edition ornament is made of patriotic fabrics and handmade beads. 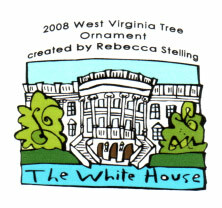 E-mail Rebecca@cabincreekquilts.com if you would like to order a collectible White House ornament.